The indisputable prince of white-grape wines, the Chardonnay grape has ancient origins and it is widespread in all areas strongly characterized by viticulture. 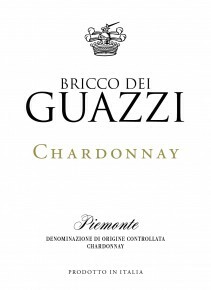 Always soft and perfumed, it reaches optimal intensity and concentration on the sun-kissed slopes of Bricco dei Guazzi. In Piedmont, Chardonnay has been grown for many years to be deserving of it own Piemonte DOC appellation. Pale yellow in color, this un-oaked Chardonnay has an intensely fruity nose. It is dry and full-bodied on the palate and is very well-structured. Ideal as an aperitif with savory canapes, with fish-based first courses, but can also be enjoyed throughout a meal of fatty fish or rich poultry.